Damascus and cobalt steel combine for the stuff of legends. Named after the legendary Japanese swordsmith Kokaji Munechika, the Passion Kokaji is a marriage of Damascus & cobalt steel for a truly exceptional scissor. The story goes that Kokaji forged an exquisite sword for the Japanese emperor aided by the god Inari. Now with their Kokaji, Passion have channelled the divine to create something that's truly fit for an emperor. The beauty of the scissors stems from the swirling patterns of the Damascus steel which not only looks fabulous, but also gives the Kokaji a comfortable textured grip. This is melded onto an inner core of harder cobalt steel which takes a razor sharp edge and gives the scissors their supreme cutting performance. 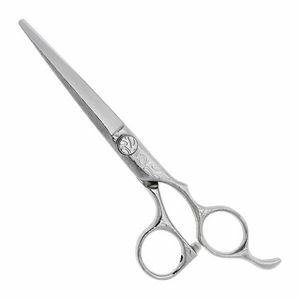 Offset handles and a fixed finger rest give a comfortable feel, while a flat tension screw allows you to fine tune your scissors without breaking the continuity of the design. The Passion Kokaji is available in 5.5 or 6 inches. £480.00 (inc. VAT) Why no VAT? We're a trade wholesaler and quote our prices without VAT to help our VAT-registered customers understand the true cost of a purchase. Smart, dark grey scissor case made from sturdy leatherette with a secure zip to keep everything safe. Inside there are loops to hold 2 scissors on one side and 2 slots on the other for your favourite combs. The outside of the case is embossed with Kobe's disctinctive logo.